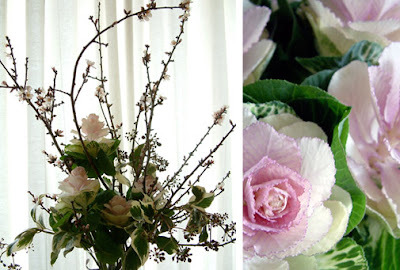 Here are some pictures of flowers I made up for Saul restaurant yesterday. 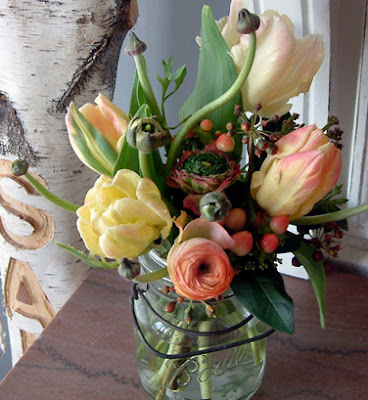 Kale, almond branches, bush ivy (above) and a small ball jar of parrot tulips, ranuncula and orange hypernicum (below). More later after I get some work done. In the meantime if you have not seen it you can check out a virtual visit I did with Pam from Housemartin yesterday for her guest blog on design*sponge. Many many good things there from her this week...read it all then scroll to the bottom to see Saipua.